• HOW DO I KNOW THAT OSMOTIC AQUATIC®THE PURIFIED ICE IS THE SMART CHOICE? • WHAT IS THE DIFFERENCE IN ICE MADE FROM FILTERED WATER AND ICE MADE FROM PURIFIED WATER? • WHAT ICE ISN’T PURIFIED? • CAN ICE MADE FROM FILTERED WATER BE CALLED PURE ICE OR PURIFIED ICE? • DOES SOME ICE LOOK PURIFIED BECAUSE IT’S CLEAR EVEN THOUGH IT ISN’T REALLY A PURIFIED ICE? • WHAT IS A CONTAMINANT? Purified water is an official name given by the Code of Federal Regulations and the U.S. Pharmacopeia to water purified by the process of reverse osmosis (RO). (*See note that follows this answer.) Water purified by reverse osmosis is often referred to as RO water. OSMOTIC AQUATIC® THE PURIFIED ICE is made from deaerated, frozen RO-purified water. A RO system is the name for the equipment that acts as a team  filtration, purification and disinfection  to produce the purified water. To be called a RO system, the system must include reverse osmosis. 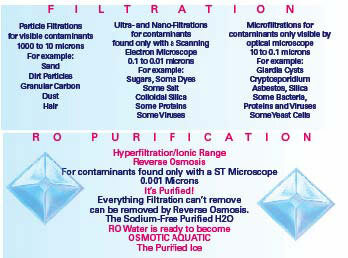 The RO portion of the RO system does the intense work of purification. The four filtrations that precede the RO purification process refine the water that is to be purified. Each filtration does a definitive job in the process; all are important to the success of reverse osmosis purification. Because UV has its greatest effectiveness against microorganisms when used to treat reverse osmosis water, ultraviolet disinfection completes the process. The RO process of the multi-level treatment train produces purified water. RO does this by using a semi-permeable membrane with 0.001 micron pores to separate out the contaminants found in unpurified drinking water (called entering, supply or initial water). To meet U.S. Pharmaceopeia Monograph prescribed methods, the entering water must meet EPA drinking water standards. The drinking water passes through multiple filtrations to prepare it for purification and then is fed at very high pressure against the RO membrane. The process leaves two kinds of water: product or purified water and waste-water or reject water. The purified water may move down the treatment train for a different or additional treatment, to storage tanks for later use or to the end product manufacturing area, for example, ice, pharmaceuticals or a bottling line. What are the membranes that produce purified water? Technically, they are not filtration devices. They are made from a synthetic material much like a film designed to allow the process to occur. Purification systems have to prove themselves over time. Constant and complete maintenance is required for all portions of the system.Testing of the water produced by the system provides information about the water being produced. When a commercial reverse osmosis system is designed by engineering professionals, there is a confidence level that the system will produce purified water. However, it is necessary to verify periodically that the equipment is consistently producing purified water that meets purification criteria. The routine testing can be accomplished by in-line monitoring equipment that performs analytical measurements of the water quality as it moves through the system. Routine or periodic testing of samples of the finished product  water or ice  also tells the manufacturer that the water “passes” the tests for purified water. Many purified water producers use a combination of in-line testing equipment and, to validate the system, a properly credentialed independent testing laboratory to test batches of the finished product. Over time, a system proves itself as a reliable producer of purified water. However, ongoing routine testing in-line and by sampling is necessary to prove that the system is consistently producing water that “passes the tests” of purification. RO systems exist throughout the United States and world-wide in major beverage and pharmaceutical manufacturing and food processing plants, on military ships and in special-needs municipalities. In fact, wherever purified water is to be the end product or is required for use in the manufacture of another product, you’re likely to find a RO system at work. Reverse osmosis as a commercially viable method of water purification was developed in response to a world-wide need to produce salt-free drinking water from natural salt water sources  desalination  and also to provide safe and transportable water for space flight and exploration. State and federal governments in the U.S. pushed scientists and researchers in the 1950s to focus on finding a process that would satisfy both needs. The first experimental efforts with reverse osmosis used natural membranes taken from animals. The successful invention and production by UCLA scientists and researchers of synthetic membranes that could take the intense pressure required in the RO process opened the way to today’s many commercial applications for purified water. Since the 1965 installation of the world’s first commercial RO plant in California, the advancements made in water purification have effected major improvements and economic growth in many important industries. In fact, RO equipment has developed its own industry that produces purification systems that can fulfill large industrial requirements as well as residential point-of-use systems. When the purified water products a RO system produces are tested periodically to confirm consistent purification results and when the system is monitored and maintained to meet quality standards for manufacturing and handling procedures, a RO-produced purified water or ice product is definitely seen by consumers as well as scientists and researchers as today’s best water and ice option for both good taste and purity. Purified ice must taste good, look good, be economical to produce in large quantities and have shown over time by water quality testing and by equipment certifications to produce purified water. Unarguably, there are other recognized methods of water purification. Some water purification methods work for some end uses but are not necessarily the best for purified drinking water or for purified ice. For example, when properly processed, distillation can produce a purified water. You may remember your mother or grandmother keeping distilled water around the house for special uses like steam irons, car batteries and cooling systems and for watering special plants. But, some say distilled water may not be the tastiest water. Purification by distillation can have variable results. Distillation requires heat; it is an energy intense process. Reverse osmosis has been proven to be very energy efficient. The cost of manufacture has a direct effect on a consumer’s cost. Brunswick Ice has been diligent in finding the most cost efficient process so that consumers can enjoy the benefits of purified ice at a reasonable cost. Distillation may need to be ‘mixed’ with reverse osmosis water to improve the finished water’s taste. Reverse osmosis water tastes crisp and clean without the addition of anything. Reports such as the one excerpted above, consistent consumer satisfaction with our products along with our testing results keep Brunswick Ice management confident that the RO system used to purify water for OSMOTIC AQUATIC® THE PURIFIED ICE continues to be our  and your  best choice. The proprietary Brunswick Ice water purification system includes multiple advanced pre-filtrations, activated carbon adsorption, reverse osmosis purification and ultraviolet disinfection. Once purified, the finished water is deaerated and frozen using the multi-patented Morris Nugget Ice Maker with Clear Ice Cycle developed by Morris & Associates of Raleigh, North Carolina. The proprietary Morris equipment ensures that the crystal clear quality of the purified water is maintained during and after the freezing process. The purification unit is comprised of a 7-step water treatment train that moves the entering water  EPA regulated drinking water  through a process that produces the purified water that is used to make our purified ice. When the four filtrations are complete, the water is ready to begin the reverse osmosis purification that pushes the water under high pressure through 0.001-micron RO membranes. The finished purified water is ready for the Morris Nugget Ice Maker. In addition to routine sampling and independent laboratory testing, the system is outfitted with automated electronic alert and shut down devices that monitor water quality during the purification process. HOW DO I KNOW THAT OSMOTIC AQUATIC®THE PURIFIED ICE IS THE SMART CHOICE? A. Purified by reverse osmosis, the water used to make OSMOTIC AQUATIC® THE PURIFIED ICE meets U.S. Pharmacopeia and Code of Federal Regulations definitions for purified water. In addition to in-line water quality monitoring, the packaged purified ice is sampled and tested routinely by certified independent laboratories using U.S. Pharmacopeia Monograph guidelines for purified water. OSMOTIC AQUATIC® THE PURIFIED ICE has passed independent testing and has no record of consumer complaint or recall. It contains no added substances and is sodium free. All Brunswick Ice products are made from water purified by reverse osmosis. Overarching the purity of our ice product is the Brunswick Ice commitment to food safety in processing and handling. This commitment is highlighted by the recognition the company and its products have received from quality centered organizations. In 2003, OSMOTIC AQUATIC® THE PURIFIED ICE was recognized by the Virginia Department of Agriculture as a processed food product under the Virginia’s Finest Program. Further evidence of the Brunswick Ice commitment to product quality and food safety is its International Packaged Ice Association PIQCS PLUS certification. The PIQCS PLUS designation indicates that the ice producer not only meets the IPIA Packaged Ice Quality Control Standards but also meets the requirements of the Hazard Analysis/Critical Control Point System. A preventive food safety program, HACCP was developed originally for astronauts. The monitoring program has been adopted by the U.S. Food & Drug Administration for various food products and by the IPIA for packaged ice. In 2003, Brunswick Ice became the first U.S. ice producer to attain the combined ice quality and food safety PIQCS PLUS designation. PIQCS PLUS certification is renewed annually by participation in IPIA-mandated plant audits performed by the world-wide leader in food safety solutions and inspections, NSF, National Sanitation Foundation, Ann Arbor, Michigan. Brunswick Ice has consistently retained its PIQCS PLUS certification. The IPIA/National Sanitation Foundation, the Virginia Department of Agriculture and Virginia-based military officials perform routine inspections of the Lawrenceville water purification and ice making plant. 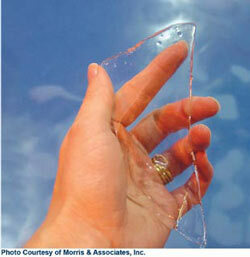 WHAT IS THE DIFFERENCE IN ICE MADE FROM FILTERED WATER AND ICE MADE FROM PURIFIED WATER? A. Filtration is just the beginning with a purification process. There are real limits to what filtrations can remove from water. When reverse osmosis purification is the goal, filtrations are used to prepare the water for purification. Pre-filtrations remove the contaminants indicated in the filtration section below. Purification by reverse osmosis is designed to remove all dissolved solids including but not limited to unseen viruses, bacteria, and salts. A partial list of contaminants removed in reverse osmosis are: Aluminum, Arsenic, Asbestos, Barium, Benzenes including Bromobenzene, Bromoform, Bromomethane, Cadmium, Calcium, Chlordane, Chloride, Chloroform, Chromium, Cop-per, Cryptosporidium, Dichloran, E.Coli, Endotoxins, Ethanes, Ethenes, Ethylbenzene, Fluoride, Giardia, Haloacetic Acids, Iron, Klebsiella, Lead, Magnesium, Mercury, Methanes, Nickel, Nitrates, Nitrites, Propanes and Propenes, Protozoans, Pyrogen, Selenium, Silver, Trichloroethene, Trifluralin, Trihalomethanes, and Zinc. Purification is the best solution. Purified ice can play an important part in removing contaminants from our diet by using it in beverages, purified water and recipes that call for ice, like flavored slushes. A. Water that doesn’t meet the requirements for purified water as stated in the U.S. Code of Federal Regulations (CFR) and by U.S. Pharmacopeia (USP) definition cannot be called purified water. To be called purified ice, the ice must be made with water that has been purified by methods specified in the CFR and by purification processes described in USP Monographs. Ice made from any water other than purified water has not earned the purified ice designation. CAN ICE MADE FROM FILTERED WATER BE CALLED PURE OR PURIFIED ICE? A. No, but some ice producers use the words pure and purity on their packaging. Terms like ‘pure water’ can be confusing; in fact, technically speaking, only purified water can be called pure water. Check the nutrition label; it should state what kind of water was used to make the ice. 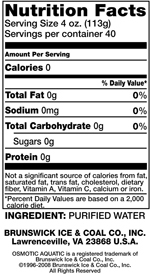 If there is no nutrition label, then it must be stated somewhere on the label what ingredients were used to make the food  remember, packaged ice is a food! If it’s not stated plainly that the ice product is made from purified water, you may want to contact the manufacturer for a clarification. Some ice packages may state that the ice meets bottled water standards. There are many kinds of bottled waters defined under the Code of Federal Regulations; the term ‘bottled water’ simply states that the “...water is intended for human consumption and is sealed in bottles or other containers with no added ingredients except that it may optionally contain safe and suitable antimicrobial agents.” The Code does define the various kinds of water, for example, drinking water, spring water, seltzer water and purified water. If the label only says bottled water, the water from which the ice was made is probably nothing more than EPA-regulated drinking water like you get from your faucet at home and the antimicrobial agents referenced can be various and with a high probability included chlorine. Ice labeled Made from Drinking Water or Made from Water that meets bottled drinking water standards is probably tap water; it may have been lightly filtered. If it is stated that the ice is made from tap water, municipal water or drinking water and you want additional information on the standards for those terms, your local U.S. Environmental Protection Agency office should be able to answer your questions or you can visit the EPA web site to learn more about current drinking water standards. If the package label involves terms like purity, pure, filtered or other terms without stating the exact type of water used to make the ice, your local U.S. Food & Drug Administration, FDA, office may be able to direct you to a source of information for your quality concerns. Keep in mind that some packaged ice is produced in an in-store ice maker and bagged by human hands. Fast food, convenience and gas station stores may be where you find this kind of backroom-produced ice. The bag may not have any information about ingredients. There may not be any sanitation or handling standards involved with the production or packaging of in-store produced or store-labeled ice. For peace of mind, you may want to inquire how the ice was produced, what sanitation and handling standards are used and what ingredient water was used. The same can apply to some unbranded types of bottled water. DOES SOME ICE LOOK PURIFIED BECAUSE IT’S CLEAR EVEN THOUGH IT ISN’T REALLY A PURIFIED ICE? A. Yes, some ice products use freezing equipment that can produce a clear ice tube, cube or nugget, even though the water used to make the ice isn’t purified. In fact, Brunswick Ice uses excellent equipment that deaerates our ice in the freezing process so that it retains its sparkling purified water clarity. Visual clarity is good and may be an indication that the ice producer cared about the visual qualities of the end product and may also be an indication of some filtration. But looking clear is not a true indication of the purity of the water. The only true way to know if the ice is made from purified water? Check the package language. A. A contaminant is a substance that makes another substance impure. Webster’s Ninth New Collegiate Dictionary also uses in its definition “to make inferior.” Contaminants linked with water quality are generally described as materials that are poisonous or polluting in nature. Drinking water, the water we use every day including well water and spring water, contains contaminants. Even water referred to as bottled water will have contaminants unless it is labelled purified bottled water. In other words, if it is not purified water, it is reasonable to assume that the water has some level of contamination caused either by undissolved or dissolved solids, probably both. We drink tap water every day. We use it in cooking. Unfortunately, contaminants exist at some level in tap water because the contaminants existed in the raw, untreated water used to make drinking water at the municipal level. Unless the municipal system includes purification (few do), it is not designed to remove contaminants, only to treat them. Yes, some municipal systems include some form of filtration but the typical filtration at the municipal level is coarse, that is, designed to remove only particles like grit, sand and other materials that can be seen or felt. Chlorine is used in almost all municipal systems as a method of rendering some of the dangerous bacterial contaminants somewhat harmless but chlorine in its own right is not good for health. Today, studies are showing that chlorine has been found to mix with other chemicals in municipal water and thereby create new substances that are also harmful to health. Many water-borne contaminants consumed in water over long periods of time can damage health. And, there are bacteriological contaminants that can exist in drinking water that is not purified that are truly dangerous to health on a short term basis. Accidental or deliberate contamination that creates a widespread emergency situation is also a concern today. Recent national polls and data published through easily accessible information online sources indicate that well over half of U.S. consumers are seriously worried about drinking water contamination. Some reports claim that water quality is the number one environmental concern in the U.S. Even with a multitude of feel-good home-based gadgets intended for water improvement, consumer worry about the water that comes out of a tap has not been abated. Studies prove that their worries have some basis in fact. Reports surrounding millions of municipal water samples confirm that over 250 contaminants have been disclosed in testing; close to 150 of these contaminants exist in water supplies without regulation. Mixed issues of regulatory compliance and lack of regulatory standards span more than a ten-year period. Other reports state that roughly only 20% of contaminants identified have some health standards regulation. To deal with the problem of some contaminants, federal and state water regulatory agencies have set limits for contaminant levels allowed in drinking water. These are standards believed to create relative measures of safety for public drinking water. Many issues are being raised about out-of-date water treatment plant systems. In almost all localities the methods used to produce drinking water have not changed since treatment plants were first installed in the U.S. Concerns are plentiful about the contaminants in tap water that are known carcinogens (cancer causing contaminants). Some of these carcinogens have not received regulatory action; some have. For lists of contaminants that are typically found in tap water, you may want to contact your local water treatment facility, health department or visit the U.S. Environmental Protection Agency online. A. Lead contamination of drinking water presents a somewhat unique situation. Regulated contaminants are measured at all water plants. Lead is a regulated contaminant. However, the level of lead measured at the water facility is not the end of the lead story. Municipal pipes leading to homes and businesses as well as the water pipes on private property can leach lead into the water as it moves from the water plant to the point-of-use faucet and ice maker. The result is a good probability of higher lead content in the drinking water and homemade ice than the initial measurements indicated. Health issues surrounding lead ingestion have been clearly identified and are real. How do you know if your health is at risk of lead contamination in your drinking water and ice? In addition to the three clues below, you may find more information about the potential for lead in your water by contacting local water and health regulatory authorities. OSMOTIC AQUATIC® THE PURIFIED ICE contains no lead.